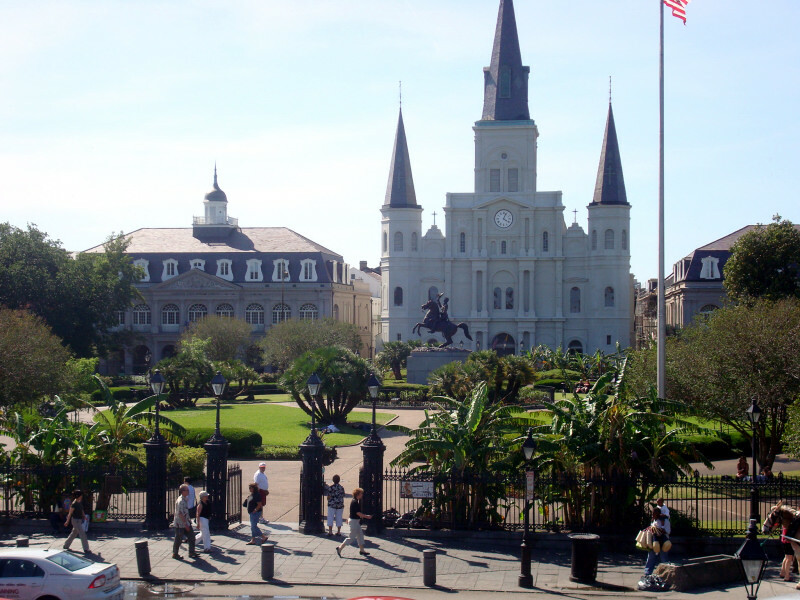 I’m smitten with New Orleans so I stayed an extra day. Last night I went out with Jackie, the other couchsurfer, and as we walked around searching for dinner, we came upon this jazz band playing in the street outside a bar. Apparently this bar was closing and this was the going-away celebration. Over a hundred people had gathered to dance and sing to the jazz music in the street, and then they paraded into the bar. 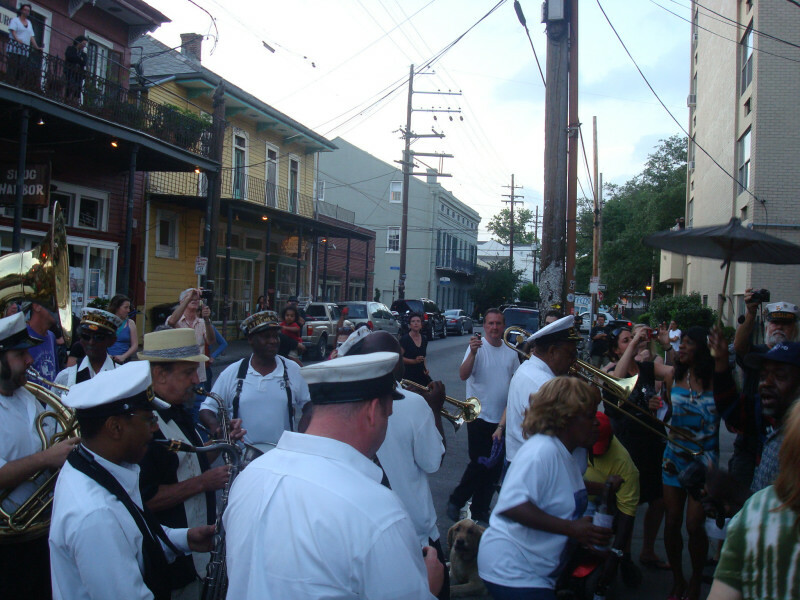 It was such a New Orleans moment. I walked by the bar again 6 hours later and people were still partying. 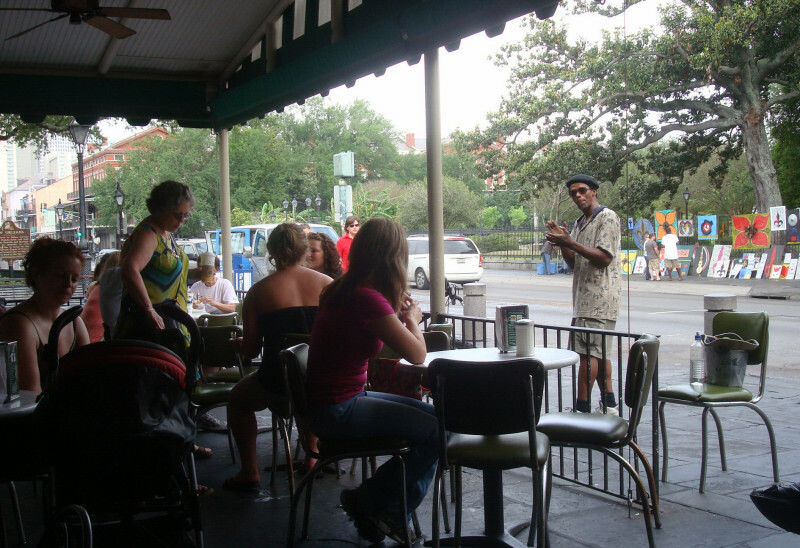 Brandon let me ride his bike to Café Du Monde, the famous coffeeshop in the city. I got iced café au lait and beignet, because about 100 people told me that’s one of the things I have to do in New Orleans. I don’t even drink coffee but I had to partake in the custom. The beignets are kind of like funnel cakes, only slightly heavier. I made sure not to inhale or exhale while eating, so as not to make the tourist mistake of getting the powdered sugar all over the place. While I was sitting there, a street performer began singing soul songs for money, and then it started raining, so I waited out the rain with my beignets. Cool New Orleans moment #2. I headed home when the rain slowed down, but then it picked up again and poured for a few minutes, giving me a nice shower. It was pretty cool to be joyriding down Bourbon Street on a bike in the rain. I went to the Garden District, home of Magazine Street, which has lots of funky shops, but it’s kind of a small neighborhood and it’s lacking in nightlife. I went out in the Quarter to ’80s night at some bar, but the music wasn’t good (how can you mess up an ’80s night?) half the people on the dance floor weren’t dancing. It reminded me of New York that way. In Pittsburgh, a lot of people don’t dance, but at least they have the common sense to stay off the dance floor! New Orleans is a temptress, but I’ve realized I wouldn’t want to live there just yet. 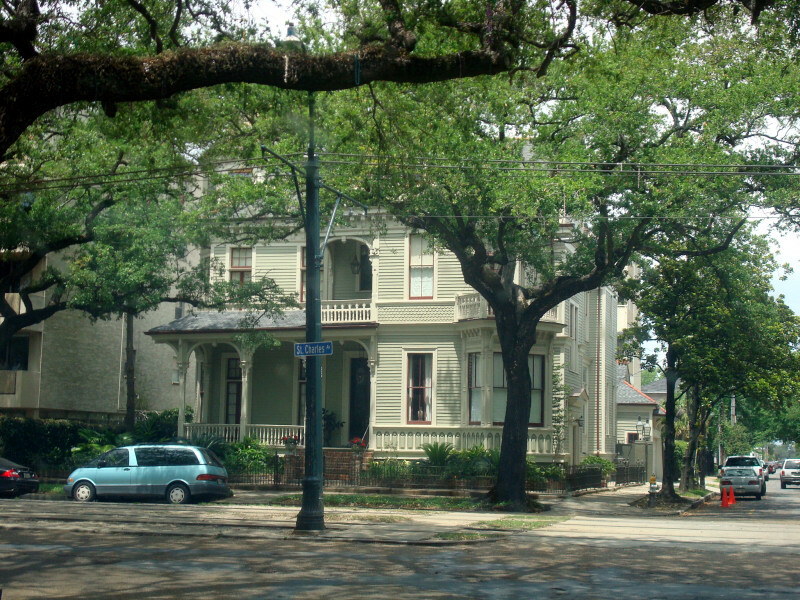 The thing about New Orleans is that while I love the colorful houses, the character of the neighborhoods, the one-way streets, the almost complete lack of chain restaurants, and the small neighborhood coffee shops, I couldn’t find the indie neighborhood because there wasn’t one. In most cities, I can wander around and find a place with a crowd that makes me say, These are my people. Here, I saw precious few folks who fit that description. The Royal/Decatur/Frenchmen area was the closest thing to a Bohemian neighborhood I could find, but even there the people were more hippie than hipster. I guess I’ll have to postpone moving to New Orleans until I’m in my mid to late 30s and the indie hipster phase has passed. Then maybe I can move there and just chill out as I grow old. 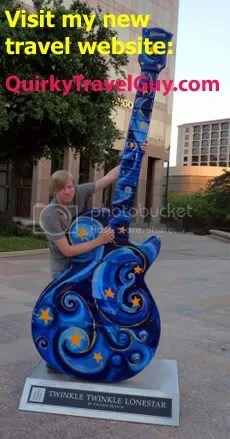 This entry was posted on Friday, May 1st, 2009 at 5:18 pm and is filed under Louisiana. You can follow any responses to this entry through the RSS 2.0 feed. You can leave a response, or trackback from your own site. What’s the difference between hippy and hipster? Shaggy hair vs dreadlocks, tight jeans vs loose clothes, bathing vs not bathing, to name a few. 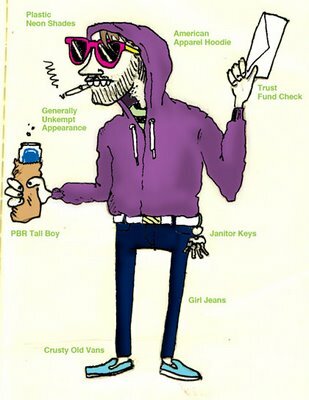 Actually, if we want to get technical, the new orleans types are more gutterpunk than hippie or hipster.